The GMAT versus the GRE. This is a video designed for people who are trying to make a decision between these two tests. 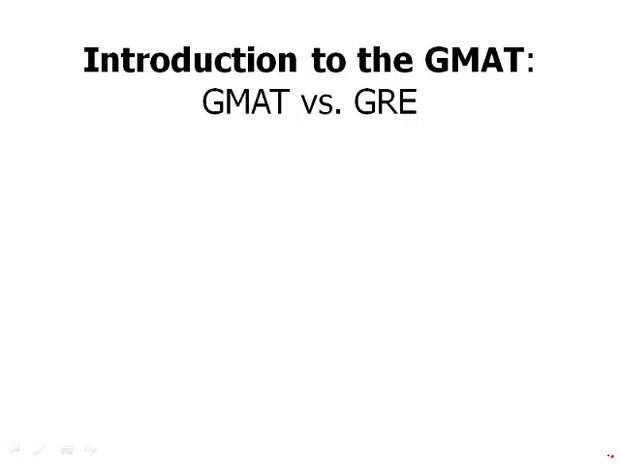 Let me first of all say, if you're taking the GMAT, and you haven't even thought about the GRE, don't even bother watching this video because it's not relevant for you. So, fact number one. All business schools accept the GMAT. Fact number two, many also accept the GRE. And so that implies a choice, which should you take? So suppose you were wrestling with this choice. First of all make sure the business schools on your list all accept the GRE. In other words, make sure by choosing the GRE, you wouldn't automatically exclude yourself from a program you found desirable. And underneath this video, you should find a link to the ETS site where they list all the business school programs, all the MBA programs, that accept the GRE. So you can verify that the program that you wanna attend is on that list. What are the major differences between these two tests? Well fact number one is, the hardest math on the GMAT is a little harder than the hardest math on the GRE. But this is a bit deceptive for the following reason. The GMAT uses computer computer adapted testing. Uses the cat. And so what that means is if you struggle with math you're not gonna see the hardest math questions on the GMAT. It's gonna be irrelevant to you. The only way that you're gonna see the hardest math questions on the GMAT is if you're very talented in math. And if you're very talented at math, you probably should be taking a GMAT anyway to showcase your math abilities. So this is a bit deceptive. People hear this and then think, oh, well, I struggle with math, so therefore I shouldn't take the GMAT. And that's not really correct. On the verbal side the GRE verbal intensely focuses on vocabulary whereas the GMAT verbal focuses on grammar. So this is certainly an interesting distinction, typically if a person is relatively strong with one they're relatively strong with the other. Now there may be times that because of a persons background maybe if they've learned English as a second language. That they would happen to be stronger at grammar than vocabulary. Or stronger at vocabulary than grammar. Something like this. So it may make a difference in some rare cases. But for the most part, this will probably might not make a difference either. And so, how should you decide? Here's what I recommend. At the very beginning of your studying find some low quality used GMAT and GRE prep books. Just go to a used book store find some cheap out doesn't really matter if they are particularly current. Then take a GMAT cold, absolutely no prep. Take a GRE cold, absolutely no prep and compare them. And basically if they're about the same, take the GMAT. In other words, if you do about the same on the GRE and the GMAT, you might as well take the GMAT. Only if for some bizarre reason you take a GMAT cold, you bomb it, you take a GRE cold and you do exceptionally well, all right. Then maybe for you, maybe giving your particular skills the GRE would be a better test for you. In general I would recommend taking the GMAT if you're gonna go to business school, and only if there's some very exceptional case should you take the GRE instead. The reason for this is the GMAT is the test designed for business school, and the skills you need for the GMAT success are to a great extent the skills you need for success in the business world. It really fits everything about a business world very well, whereas the GRE is designed for academic pursuits that are unrelated to business.